We are beginning Medieval history next week and one of my favorite things to study throughout the whole of this period are illuminated manuscripts. I will probably post about them more than once because their stories are often amazing and the artwork and craftsmanship that went into making them are bar none. Take for example, the Codex Aureus of St. Emmeram. This beautiful "Gospel Book" is said to have been completed by two monks for the grandson of Charlemagne, Charles the Bald in 870. During the Carolingian era, King Charlemagne believed in the spiritual powers of gemstones and minerals, and their magical connection to heaven. He believed sapphires symbolized an image of heaven, heavenly virtues, and eternal life. 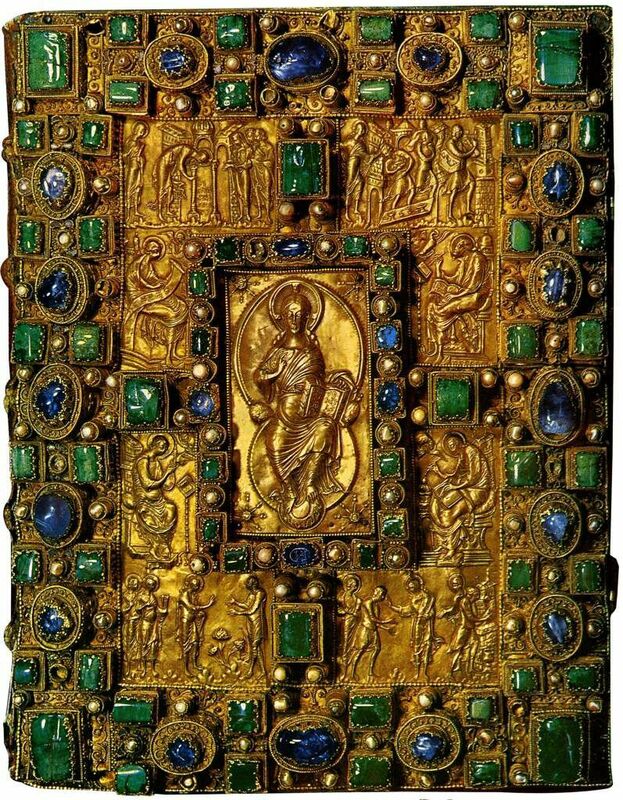 Charlemagne passed down his interest in the spiritual qualities of gemstones to his grandson, Charles the Bald, who ordered the Codex Aureus and Lindau Gospels to be written in 870. The artisans created the covers with emeralds, sapphires, rubies, garnets, agate, and pearls. The standard of the work is extremely refined, with each of the gems in a setting that rises up from the plane of the cover and is decorated with fine detail. The "claws" holding the gems in place are minutely formed as acanthus leaves; earlier jeweled metalwork usually used plain "claw"-type settings. “I am the way, and the truth, and the life. No man cometh to the Father, but by me." At the Wiki link above, there are other photos of some of the illuminated pages. The detailed artwork is beautiful. What strikes me is that the gospels were valued enough to have been treated in this way. 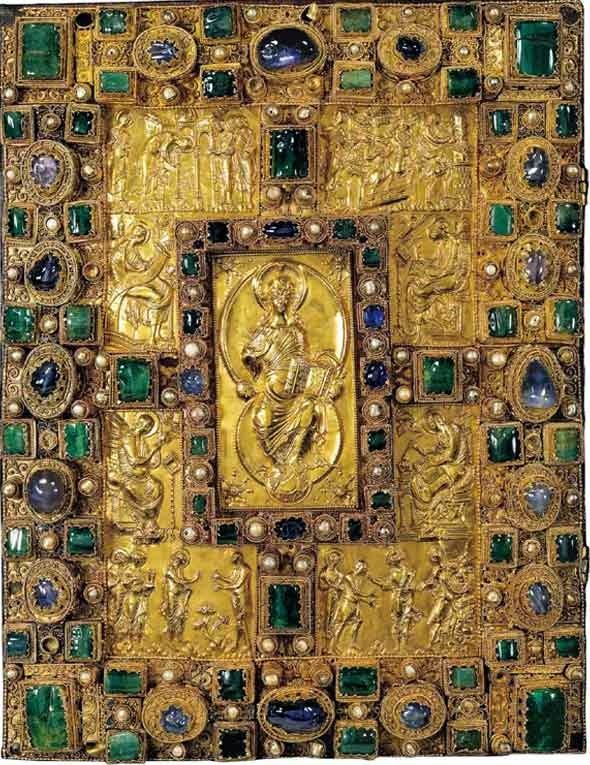 The amount of money, gold, and gemstones it would have taken at this time to create this astonishing book is immeasurable. I wonder who was allowed to read it; probably not very many people! It is so easy to ignore the gospels--all scripture really--to rush on with my day. It is so easy to put my busyness in front of what is really, a golden book. My Bible doesn't have the sapphires and the emeralds, and is not covered with gold, but it has a treasure much richer and deeper--and life changing--than the cover art. Jesus is our treasure. As Matthew 6:21 says, "For where your treasure is, there your heart will be also." Let my life be rich in the treasure of Christ. LOVE that last paragraph. Stated so well. Doesn't matter how "plain" our Bible is, the beauty is inside.